Original photo: https://flic.kr/p/9WSu Changes mine. I am delighted to share with you an interview with David Crystal, who is one of the best-known and respected linguists. TEFL Equity Advocates had the pleasure to talk to him about native and non-native speakers, their role in teaching English, as well as the problem of discrimination of the latter group in TEFL/TESOL. 1. We are going to use the terms Native Speaker (NS) and non-Native Speaker (NNS) quite a lot in this conversation. Could you please briefly define the two terms? A NS is someone who has learned a language (or languages) through the normal processes of child language acquisition. This means having an intuition about such things as nursery rhymes, babytalk, family slang, the regional accent and dialect of the home community (and nearby communities), language play (of a childlike kind), the rituals of child-related cultural events (such as Christmas carols, Easter, birthday chants…), and so on – as well as the interaction between these early variables in different languages in cases of bilingualism, trilingualism, etc. A NNS lacks all this. Most come to learn a foreign language ‘top down’, usually beginning with the adult standard dialect and prestige accent of that language, and focusing on the formal and informal varieties felt to be most useful to their communicative needs. Note that this focus on child language acquisition means that there can never be a sharp distinction between NS and NNS. It is possible to begin learning a language at any age, obviously, so that a child beginning to learn English at age 3, 5, 7, 9… will acquire different amounts of NS intuition. 2. The CEFR defines C2 language level as native-like, which suggests it is still somewhat deficient and not quite ‘native’ yet. In your opinion, what does it mean to speak a language on a native level? Is it any different from being proficient or fluent in a language? A selectivity has taken place here. The implicit comparison is between the standard variety of language learned by a NNS and the standard variety learned by a NS. Note that both processes are a result of education, for most people. Only a tiny proportion of people have had standard English as a spoken language in childhood (I would put it at around 4 or 5 percent). Most people grow up in a regional setting in which nonstandard grammar (for example) is normal (saying ain’t, I were sat here, using double negatives, and so on). They learn standard English (which means, in the first instance, written English) only when they go to school, where they develop a sense of the formal rules required by that variety, and then generalize these to their spoken output. At least, that is the aim. Much of the angst encountered in the media today comes about as a result of a concern that children are not developing a fluent mastery of standard English, in both speech and writing. When this sense of inferiority continues into adult life, it is the basis of the often-heard observation that ‘foreigners speak better English than we do’. I view native-like fluency as a NNS who has achieved a command of the phonology, orthography, grammar, lexicon, and discourse that is indistinguishable from that presented by a sociolinguistically comparable NS. This sounds straightforward enough until one starts to spell out the variables. Lexicon size, for example, is a can of worms. There are well over a million words in English. I know less than a tenth of these, and use less than a twentieth in everyday settings. So how fluent does that make me, lexically? A NNS English-using biologist far outstrips my lexical ability in the relevant specialist terminology. Assessment procedures are not brilliant at taking this kind of semantic and stylistic context into account. And sociolinguistically: we must also compare like with like. NSs of what educational level compared with NNSs of what educational level? We know from sociolinguistics that there are many differences in practice between NSs, in terms of age, gender, class, profession, communicative medium, and so on. For the notion of ‘native-like’ to make sense, we need to ask always: ‘what kind of NS?’ Most examiners, I suspect, use themselves as the comparator, and would actually have some difficulty if they were asked to compare a NNS to a NS with a different social background to themselves. In the end, it comes down to what one needs in order to live life as a (NS or NNS) person. Very few NNSs ever develop intuitions about local accents and dialects, for example, because they don’t need to; but many NSs do not develop intuitions about a range of formal varieties that NNSs handle with unselfconscious ease. 3. Some people will still insist that NS will always speak ‘better’ English than NNS. They’ll have a broader vocabulary range, an infallible intuition about grammar, and speak with ‘correct’ pronunciation. How would you respond to this and to what extent does this have a bearing on every day language teaching? The notion of a broader vocabulary range is a myth. Most NSs have no idea of how many words they know or use, and I don’t know of any tables comparing lexical range between sets of NSs or NNSs. A huge mythology is ‘out there’. A favourite example of mine is the news report I saw once saying that ‘the average Sun reader has a vocabulary of only 500 words’! I blogged about this. It’s nonsense, of course, but the point is relevant to the present question: NNSs who have achieved a high level of education, either formally in school and university, or through work experience, will have a larger vocabulary than many NSs. And the size of this vocabulary will be much greater than either NSs or NNSs think. As for another myth – grammar intuitions – the existence of usage guides since the 19th century (Fowler, Gowers, Partridge, etc) shows that there are major differences of intuition about what counts as an acceptable grammatical construction in hundreds of well-recognised cases (split infinitives, beginning sentences with conjunctions, saying I will or I shall…). As of 2014, there is a new database collating all these usage guides to show how trends have changed over the decades (the HUGE – Hyper Usage Guide of English – database, compiled by a team from the University of Leiden). It shows that people row about grammatical usage all the time. There is no such thing as an ‘infallible’ intuition. Similarly, with only around 2 percent of the population of England now speaking some sort of RP (an accent that has in any case changed its phonetic character markedly over the past 50 years), and with most NS teachers of English all over the world now using a range of accents – modified RP, modified British regional, American, Australian… – the notion of a single correct accent is as outdated as the Empire out of which it arose. None of this affects the choice of a model for teaching production. If teachers are used to teaching, say, standard British English and RP, they will carry on doing so, as this is a perfectly respectable variety (even though RP has accreted some negative associations in recent years). Apart from anything else, it will sit comfortably with existing teaching materials and examining practices. But when it comes to teaching comprehension (listening or reading), then it is essential to familiarize students with the diversity that is ‘out there’ – starting on day 1. I see many teachers doing this now. And the best teachers, in my view, are those who have a strong language awareness of global English dialects, stylistic variation (including online), and usage alternatives, and who know the literature on these issues. It is metalinguistic knowledge, combined with fluency, that ultimately produces the most efficient language teachers. Fluency alone is not enough. All sorts of people are fluent, but only a tiny proportion of them are sufficiently aware of the structure of the language that they know how to teach it. What is important, of course, is that NNS teachers make sure their own metalinguistic batteries are topped up, otherwise they lose their advantage. 4. NNS outnumber NS by almost 3 to 1. Yet, the mainstream TEFL/TESOL seems to be obsessed with the ‘native’ model, often relegating other factors (e.g. qualifications) to a secondary role. How would you comment on this obsession? Shouldn’t a greater emphasis in teaching be placed on communicativeness and intelligibility, rather than ‘sounding’ native? Your ratio is well out of date. It’s around 5:1 now. But that makes your point all the stronger, of course. Sounding native is no longer the point. I can think of only one category of person who needs to sound native – ie totally lose a NS identity – and that is: spies. Everyone else should be proud of their NS identity and not wish to lose it. The critical questions are, as you imply, semantic and pragmatic: can I get my meaning across clearly and effectively. And to those two critieria I would add: and without losing NS identity. Just as I want to experience the glorious diversity of English accents and dialects in Britain, which enrich our linguistic and literary heritage, so I want to experience this diversity on the newly emerging global scene. I want to hear X-tinted English – fill in the ‘X’ by Canadian, French, Russian, Ghanaian, Brazilian… what you will. It would be a sadly denuded English linguistic world if people were being taught as if this wonderful series of varieties did not exist. The obsession you refer to is understandable, given the long time-frame in which attitudes to language change operate. But it’s already considered totally out of date by many institutions, such as the British Council, and the exam boards that I know are already becoming more tolerant of diversity. I think the antagonism will be gone within another generation. But we are in a transitional period between these old and new linguistic mindsets, so the problem you raise is unfortunately still widely encountered. 5. Most people will agree that language and culture are inextricably connected. Many recruiters who refuse to hire NNESTs, justify their policies by claiming that only a native speaker can transmit ‘the target culture’ to the students. Do you think this view is justified? In view of its incredible diversity, is there anything we can call ‘the culture’ of English? There are lots of fallacies underlying this argument. Culture isn’t a monolithic thing. It consists of tens of thousand of tiny points as well as many general issues. No NSs have experience of or understand all aspects of the culture to which they belong. Do you know everything about the music, literature, architecture, painting, folklore, religion, politics, sport… of your culture? Of course not. So there’s no reason to expect NNSs to know it either. In any case, what is ‘target culture’ now that English is a global language, with English-speaking communities everywhere? It’s no longer just Britain or the US. We have to prepare our students to encounter English in any country they happen to visit or encounter through the media, and this means a multiplicity of targets. The English spoken in each country has its own cultural distinctiveness, reflecting the society of which it is a part. I sometimes have trouble understanding the English spoken in, say, New Zealand or India or the Czech Republic because I don’t understand the cultural knowledge that the English spoken in these places expresses. I’ve written about this at length elsewhere, so I won’t repeat myself here, other than to say that this dramatically reduces the distinction between NS and NNS. A NNS English-language learner can go to South Africa, say, and not understand those aspects of South African English that reflect local culture. But when I first went to South Africa, I couldn’t understand them either. I felt like a NNS. Familiarity, of course, breeds content – and this applies to NS and NNS alike, with sometimes the NNS being ahead of the NS. If NNSs know South Africa well (either by travelling there or online), then they will be at a linguistic advantage over NSs who do not know it or know it hardly at all. And all NNSs, by definition, know the culture of their own country better than outsiders do, so that they already have an expertise they can bring to the global English mix. Anything that is known can be taught. The reason the culture question seems powerful is that we still don’t have the teaching materials which would enable it to be taught well. How many accounts of English language and culture do you know? The Longman Dictionary of English Language and Culture (LDEL) was an early attempt to do this for the lexicon. The Global course has a strongly cultural perspective. But we still lack a truly comprehensive and principled teaching syllabus for cultural issues. Culture is still introduced in a sporadic and unsystematic way – in passing, such as in Chapter 15 about the past tense, which just happens to take place at the Tower of London. The force of the culture argument will disappear when we get good pedagogical guides to English language and culture. And this is something every teacher can contribute to. Is there a cultural guide to your country in English – a kind of local equivalent of LDEL? If not, why not do something about it? 6. Often the issue is not only discrimination against non-native speakers, but also the privilege accorded a priori to some native speakers in the ELT business. Being a native speaker, could you say something about your experience of privilege, where that privilege didn’t spring solely from your professional expertise? Would you be prepared to forego it in the name of equity? I’m afraid, not being an ELT teacher, I don’t have experience of these situations. 7. In the Q&A session during the ELTForum you said that prejudice and stereotype are very slow to disappear (you can watch the video here). How could the parties involved in English language teaching (e.g. language associations, teachers, schools, recruiters, etc.) speed up this process and promote professional equity of NESTs and NNESTs? Well, one way is to spread examples of good practice as much as possible. I’ve seen many places where the obsessions and prejudices you refer to are simply things of the past, and where teachers and others are actively working on developing new materials and strategies. I can think of at least a dozen visits I’ve made abroad over the past ten years where the focus has been on collecting cultural material for classroom use, as I suggested above. 8. What message would you give to the teachers who have seen or suffered discrimination based on their mother tongue or country of birth? Remain forward-looking as much as you can. Reflect on the progress that has been made over the past twenty years, and look forward to the further change that will take place in the next twenty. Remember that you are working in the middle of a transitional period between mindsets, which is always a painful process. Tell the world about your experience – easy to do these days, with online forums – because it is voices like yours which help to change climates of opinion. And don’t suffer in isolation. Get in touch with one of the big teaching organisations, such as IATEFL, where these issues have been widely debated and where you’ll find lots of like-minded professionals concerned to make change happen. For more interviews visit Talk to the Expert section here. 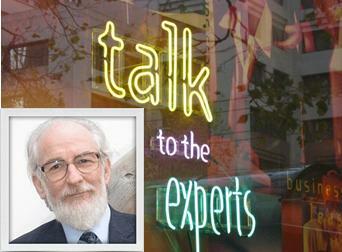 David Crystal is one of the most renown linguists and currently the patron of IATEFL. He has (co-)written over 120 books including the famous Cambridge Encyclopaedia of the English Language. He has also collaborated with BBC Radio 4 on a series of podcasts on languages. His full biography can be found here. I would have liked the question of “cognitive load” and teaching English in English by NNESTs addressed. I find it rarely brought up or considered. I’ve taught as a NS and also NNEST (French). I speak French very well, C2 and above. However when in the classroom and with the thousands of things/decisions a teacher must make bearing down on me – my French brain just melts down. The cognitive load is too much for me to both speak French and teach (be) French. It takes a non native teacher very many years and a very high C2 like fluency to realistically teach in English and meet all the demands that are required by a teacher. I remainly firmly in the camp the non native speaking teachers should be compensated and have equal rights/rewards as native speaking Eng. teachers. However, they should not be expected to teach in English unless very fluent and with a fluency developed by extended time abroad/immersed. Asking them to be like Native speakers is the real problem. I have never actually heard of it, but I’m glad you brought it up. Personally, I have never been affected by it when teaching English (I’m a NNEST). However, I’ve felt it when teaching Spanish and – funnily enough – my mother tongue, Polish. It didn’t have much of an effect on my teaching – and after a few weeks it was back to normal – but I did feel slightly less comfortable than when I was teaching English. I’d put it down to the fact that I had never taught Spanish or Polish before, and my brain was thinking about the classroom management, giving tasks, etc. in English while speaking and teaching a different language. What I’ve also found, was that it was very difficult to come up with examples of language or definitions on the spot. Again, I think it was the lack of familiarity and experience. In a comment on this post: http://teflequityadvocates.com/2014/06/05/who-owns-elt-the-halo-effect-by-nick-michelioudakis/comment-page-1/#comment-257 Dave Boydon argued that comfort or discomfort with a language has less to do with being a native speaker and more with the familiarity of the situation and the context. I’m inclined to side with him there. What do you think? I would agree that NNESTs should be expected to prove a high level of proficiency when applying for jobs. Usually, C1 or C2 is enough. Noted linguist or something else, authorities in any field who have often lectured, published and established a reputation for being on top of it also frequently mislead others by claiming that which may or may not be valid or true. This native vs. non-native speaker judgment series, for example: true native speakers, educated vs. uneducated, and we need to differentiate, will tend to have a wider vocabulary than the NNS. Knowledge of slant, jargon, academic vocabulary and more will tend to be more extensive. Thanks for going into the trouble of commenting. Could you clarify your comment a bit? Are you arguing NESTs always have a wider vocabulary? If so, what evidence have you got for it? Old thread, but anyway… Marek, I find it absolutely mind-boggling that Frank would have to prove his point. What about the other side – the burden clearly lies there. I’d be grateful if you could point me in the direction of any research in that area, should you know of some. Thanks for commenting. I’m not sure why it would be mind boggling. I think that typically the burden of proof lies with the person making a claim. Marek, nice to see you asking David Crystal about his experience of privilege. Shame, though, that he just brushed the question off. Arguably, there is a connection between the NEST-NNEST issue and the overwhelming dominance of the English language in academia (not causal, certainly, but the two proceed hand in hand). Okay, Crystal isn’t a teacher in an English school, but he’s an academic. If Cantonese were the linguistic superpower and he were obliged to write and speak in Cantonese, I imagine he might have one or two things to say about the privilege enjoyed by academics who are native speakers of Cantonese. But as it is, he just brushed the question aside. Shame. A separate issue is Crystal’s final piece of advice to NNEST’s: Don’t despair; join IATEFL because they are on the same wavelength as you and they are pushing really, really hard for global equity. Would be interesting to hear if non-native speaker teachers feel that that is good advice. Your website seems to suggest an alternative approach: Organising and campaigning from the grassroots up. That strikes us as a better approach than pinning hopes on institutions like IATEFL. Couldn’t agree more. I wondered whether I should push the matter and rephrase the question, but I decided against it. I’m going to interview other linguists and EFL professionals for this website, so hopefully some of them will have something to say about the issue of privilege. Thanks for helping out with that question, though! I’m also a bit sceptical about joining IATEFL as a good piece of advice. They’ve been around for a long time, but have failed to issue a public statement against discrimination, or otherwise openly campaign against it – at least as far as I’m aware. And I’d say they mightn’t ever until somebody (we?) pushes them to do so. While I feel that the big players have a very important and an essential role to play in bringing about equity (they have the power to force schools to abandon discriminatory hiring policies), the change must come from the bottom, from the individuals who have been discriminated, and from those who have seen it but failed to react. It is unlikely that those in power will change things out of their own accord or good will – those at the bottom need to ‘force’ them. Such a great scholarly article! I’m glad you like it, Morteza. This article has come in handy because I have just been denied of my application to teach English on an on-line course because the door is “closed to non native speakers,” says the reply. I thought I was used to this reply, but I was wrong. I am not used to the reply and I will not be used to the reply. Thanks for commenting. I’m sorry to hear that, but I’m glad you won’t to fight against being discriminated. What course was, it? Perhaps we could put together a post about your case and publish it here? In my research of online English language providers, of which many are based in China or serving China, I noticed they all stipulate NSs. I’m very pleased to say as an online business, Tangent Training Co Ltd advertise all of our positions to qualified, professionals who teach English, wherever they were born, live or reside. Our next move is to post without even mentioning the ‘N’ words. The person who has sent me the message is James Leaver and he is now promoting on line teachers at http://www.linkedin.com/groupItem?view=&item=5894364203656970243&type=member&gid=116744&trk=eml-group_discussion_new_comment-discussion-title-link&fromEmail=fromEmail&ut=28IyuvDWcjt6k1. It is a LinkedIn page and you may not be able to open it unless you are a LinkedIn member. Discrimination against non-native speakers of English is often found in many segments in the world of English education. I am convinced now that it exist not only in Japan but in other parts of the world. Of course I new it all along but I was explicitly denied of my application by him. For your information, I am organizing a professional organization The United Voice of English Teachers (http://unitedvoiceof.blogspot.jp/http://unitedvoiceof.blogspot.jp/), and one of its goals is to address racial discrimination existing in the world of English education. I am thinking, maybe you and I could formulate some kind of coalition, before accusing James? U-VET is a new organization and will have the inauguration meeting on Aug. 23 in Tokyo. I’ve joined the inked in group. Thanks for directing me to it. I would love to contribute if I can to U-Vet and help you fight for professional equity. Please email me through the contacts section and we can discuss ideas how to collaborate. If you have saved your application and James’ reply, they would be most useful. How about you put together an email to James (or an open one) where you explain why and how you have been discriminated against? Very interested in the perceived differences in vocabulary range that was mentioned. I suggest a visit here http://testyourvocab.com/blog.php and try the test. There may be some interesting results for the N v NN argument.